"Bortone's excellent treatise on prepositions from Ancient to Modern Greek is a welcome contribution to our knowledge of the language... with a detailed examination of prepositions, postpositions and cases in a set of typologically diverse languages, and a thoughtful discussion regarding the provenance of such elements. The result is a very impressive piece of scholarly work that showcases both philological and linguistic analysis at its best.... B provides an impressive account... very thoroughly examines evidence from a wide variety of languages... tackles the challenging and wide-ranging issue... argues successfully... providing a nuanced description... augmented by helpful visual depictions... he covers a plethora of topics... a thorough description... a meticulous analysis... His mastery of Greek at every stage of the language is beyond doubt, and he uses it expertly... His book will certainly become an invaluable companion for classicists and scholars of Greek, but also an important resource for advanced learners... amasses an impressive array of facts from such a typologically diverse set of languages that it allows the reader to form a coherent picture... Overall the volume is very well-written, with lucid and precise language that is a joy to read — especially when one considers how challenging the subject is... a tour de force of classical and linguistic erudition, and a testament to B’s skill at synthesis... truly excellent work"
"an extremely impressive book... very convincingly argued... an indispensable source of examples... B. 's linguistic breadth is also remarkable: it is clear, especially from the first half of the book, that he is extremely comfortable with scholarly literature on cases and prepositions in a wide range of languages and time periods... splendid... [readers] will not be disappointed"
Although Bortone is admirably cautious about the general application of his conclusion... its demonstration is a major achievement. But it is only a small part of the insight into the long-term development of the Greek language that the reader will gain from this perspicacious book... Bortone sketches a rich picture of what has been happening... a major achievement... a work that combines the broadest possible chronological framework with a firsthand detailed collection of examples that convincingly demonstrate the diachronic developments. It is presented in a carefully structured, though not overly rigid, theoretical framework... If you find discussions of how language works and how it develops interesting, read this book." "Within the extensive documentation of Greek over three millennia, Bortone demonstrates quite convincingly that the Greek data can provide concrete diachronic evidence for his working hypothesis... Bortone’s pronouncements on the contentious issue... are well-informed and judicious... Bortone’s treatment of the Greek prepositional system, especially during its Hellenistic and Medieval stages, is a contribution to the field of Hellenic studies. It should be of interest to a large audience of Hellenists (classical philologists, medievalists, scholars of Modern Greek), and historical and theoretical linguists"
"‘a masterful treatment of an important and interesting topic… [Bortone] presents a convincing analysis, along with a wealth of data, and his broad chronological coverage of Greek is not only admirable, but unusual... the results are quite striking and valuable. The empirical richness alone is reason enough for me to expect it to attract a considerable amount of attention"
"For an examination of Greek Prepositions from Antiquity to the Present, we now have the recent magisterial work of that title by Pietro Bortone... 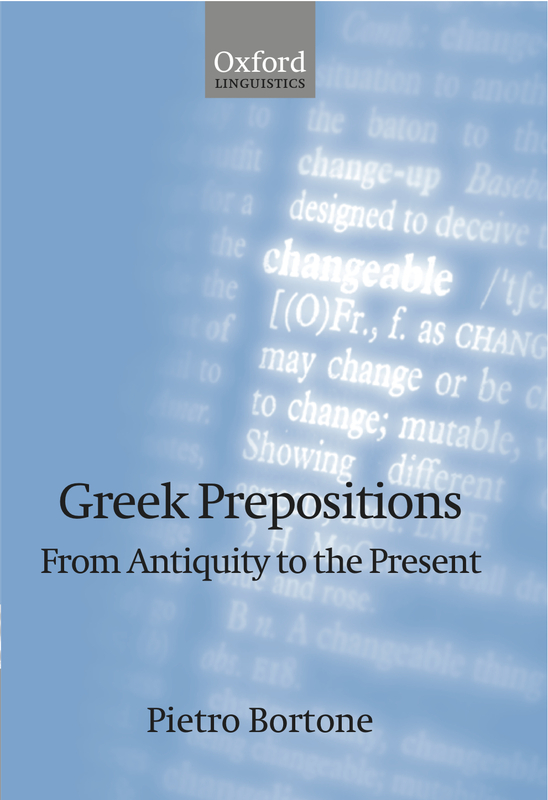 In his comprehensive and authoritative treatment of Greek Prepositions from Antiquity to the Present (2010), P. Bortone has successfully defended his central thesis"
"a detailed diachronic study (with synchronic focuses) on Greek prepositions... The first three chapters of this fascinating book will be of most value for New Testament students who have a solid background in Greek... It will also be of interest to linguists. The countless examples from other languages will enhance its value for Bible translation... In addition, Bortone contributes to general linguistics by validating the localistic hypothesis in a single language"
"Medieval and Modern Greek scholars... will likely view Bortone as an incredibly useful contribution to both theory and description... even the student of Hellenistic Greek will find that Bortone provides an essential framework for understanding how prepositions work... [Bortone] also provides an extremely useful discussion of improper prepositions, which tend to be largely ignored... Bortone provides an extremely accessible and useful explanation of how the seemingly arbitrary meanings of prepositions and their cases are organized... Bortone’s extensive and detailed introduction is likely the most accessible and useful introduction to cognitive linguistics that the traditional philologist or scholar focusing on a particular period of Greek’s history could ask for... the... content is top quality... anyone who is involved in teaching Greek should make part one of Bortone required reading for their students... [Bortone's] extensive discussion of semantic theory is unmatched in both clarity and detail"